The Toughest Workers of our Rotating Displays. Just choose a structure: Black or polished Chrome, and don't forget the tower colour choices: Putty, Black, Brown or Clear. 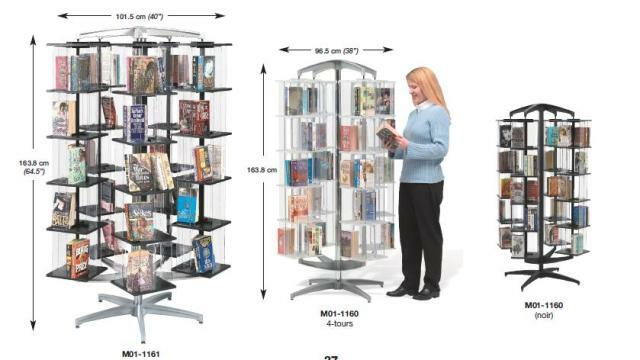 If these display units were football players, they'd be linebackers. We put 'em together with a center steel column that's built to take a lot of abuse- and with media towers that are just as tough. As you can see below, they have the capacity to do the job, while taking up just nine square feet of floor space. They're built in modular construction for easy maintenance. But they're never going to need much attention from you. Best of all, the price is right. These are our most economical units. 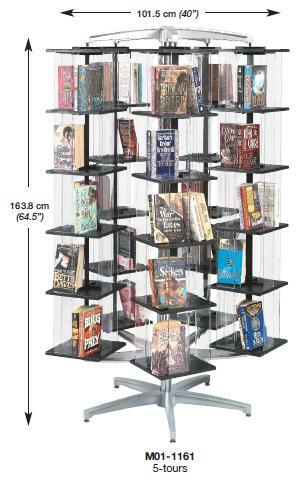 Please specify black or chrome frame and add shelf colour when ordering: Putty, black, brown, or clear.